Barnett Fine Art has many special works available on consignment from some of our local artists. This week, we’ll take a look at three of these New Orleans natives and some of their works available on consignment. One of the city’s most well-known artists, George Dureau embodied the culture of New Orleans in a way that few others have matched. Dureau lived his entire life in the city, soaking up its unique cultural mix and distilling it into art that captured the psyche of New Orleans in a poignant and honest manner. Though he may be best known for his photography, Dureau was also a skilled and accomplished painter. His works can be found in museums and public spaces throughout the city. 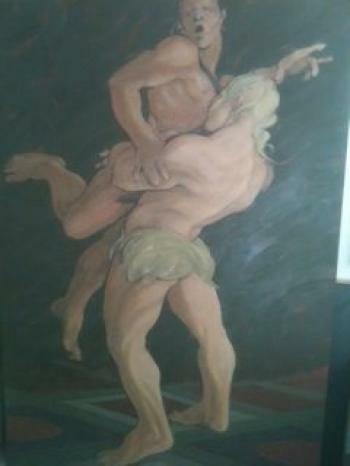 Below is Dureau’s oil painting Hercules and Anteaus, available on consignment from Barnett Fine Art. Every New Orleanian is well-acquainted with the soft yellow eyes of George Rodrigue’s Blue Dog. 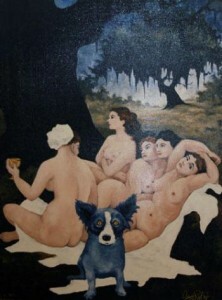 Blue Dog first showed up in Rodrigue’s works after the death of his dog Tiffany in 1984, and by the 1980s could be found consistently throughout his works. National advertising campaigns as well as posters featuring Blue Dog for the New Orleans Jazz Festival brought Blue Dog into the public eye, and he hasn’t left since. Below is the 1992 Right Place Wrong Time, a direct image transfer on canvas. A Limited Edition, but not numbered, and 40 x 30 inches, this work is available on consignment from Barnett Fine Art. The mention of Blue Dog often reminds us of his relative Charlie the Cat. 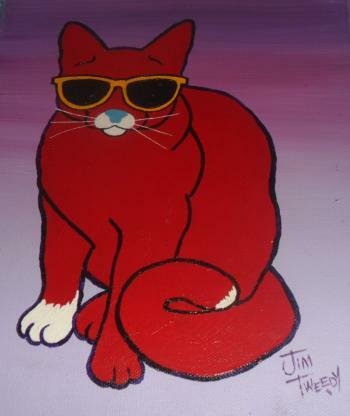 Inspired by Blue Dog, New Orleans artist Jim Tweedy decided one day on a whim to paint a red portrait of his cat Charlie, figuring the opposite of a blue dog would be a red cat. He hung it in the window of his gallery and was amazed when a woman walked in and commissioned another red Charlie of a different size for $3,000. The cat was out of the bag, and Tweedy has done more than 1,000 Red Charlie’s, later moving on to an equally recognizable Friendly Doggy series. Below is Charlie the Cat, an original work on canvas at a very favorable price. This entry was posted on Friday, October 17th, 2014	at 4:53 pm	and is filed under Consignment Services	. Both comments and pings are currently closed.